Founded in 1989 in Lafayette, LA, Krispy Krunchy Foods offers a quick-serve restaurant concept with more than 1,700 retail locations in 27 states. 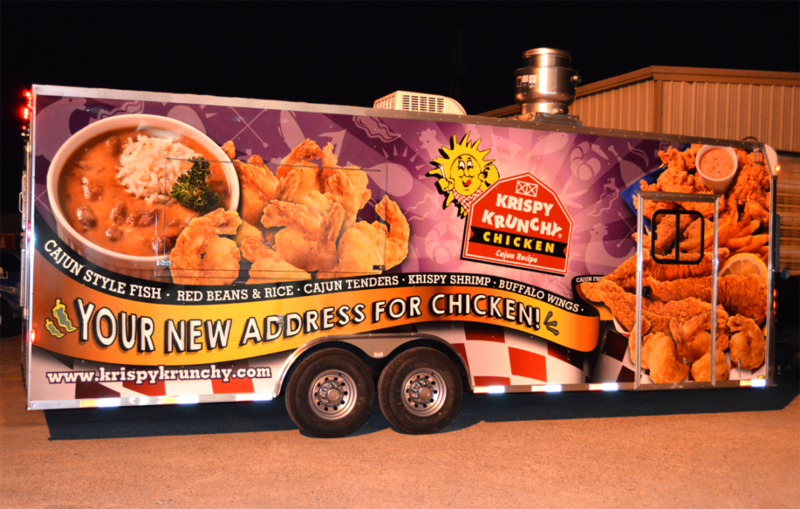 Krispy Krunchy features Cajun-style chicken which is always fried in zero trans fat oil. The pre marinated chicken and tenders are delivered fresh, twice weekly by it’s distributors. Krispy Krunchy offers a completely customized program with NO royalty fees. 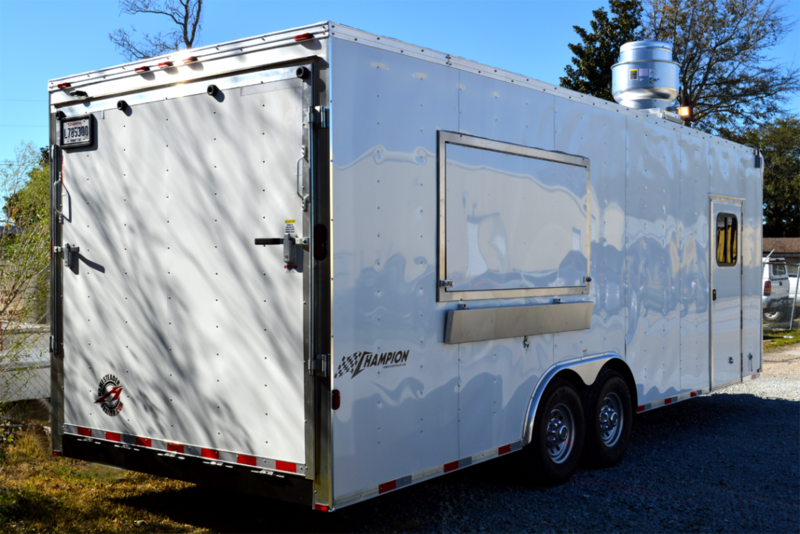 It is designed to give operators a professional and branded image with the ability to deliver quality food to their customers at a low price. 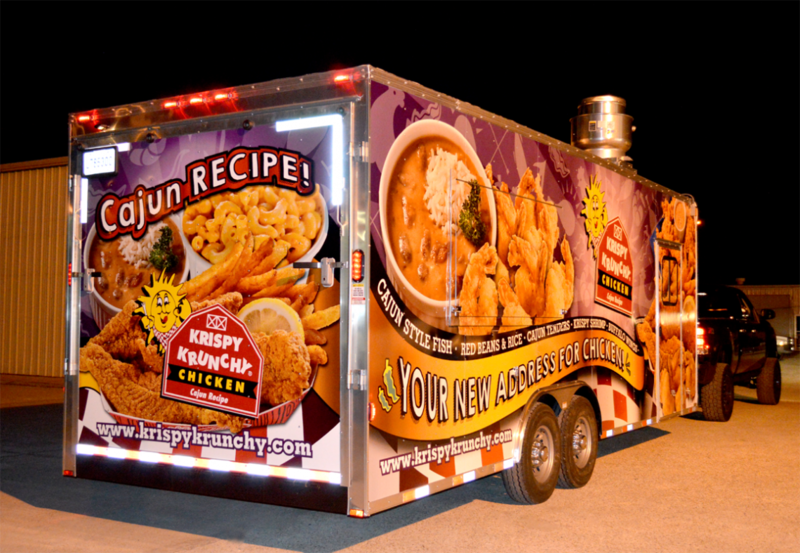 Pixus Digital Printing would be remiss not to share its appreciation as official supplier of graphics to Krispy Krunchy over the years, and is especially appreciative for the opportunity to wrap its corporate trailer in a bold, colorful and recognizable 3M adhesive vinyl. There’s a common trajectory for c-store retailers entering the foodservice fray: Coffee sales beget breakfast sales, breakfast begets lunch, and lunch begets dinner. But finding a retailer who has made it to the end of that path is a rarity. Most are stuck chasing the elusive dinner day-part, not to mention sustaining foodservice sales through the weekend. But some have cracked the code, and the solution involves chicken. And darn good biscuits. A promising chance to win at dinner and weekend foodservice sales isn’t the only thing that led others to work with Lafayette, La.-based Krispy Krunchy LLC. The company also has a unique partnership structure that retailers find easy to swallow, so much so that it’s experiencing an expansion blitz to the tune of more than 1,200 stores in three and a half years. To create a new profit center for the convenience store industry with a professional food service concept that enhances overall store profitability and image.